Today’s version of “Olivye” only slightly resembles the original creation, even though exotic foods are available in Russia now. 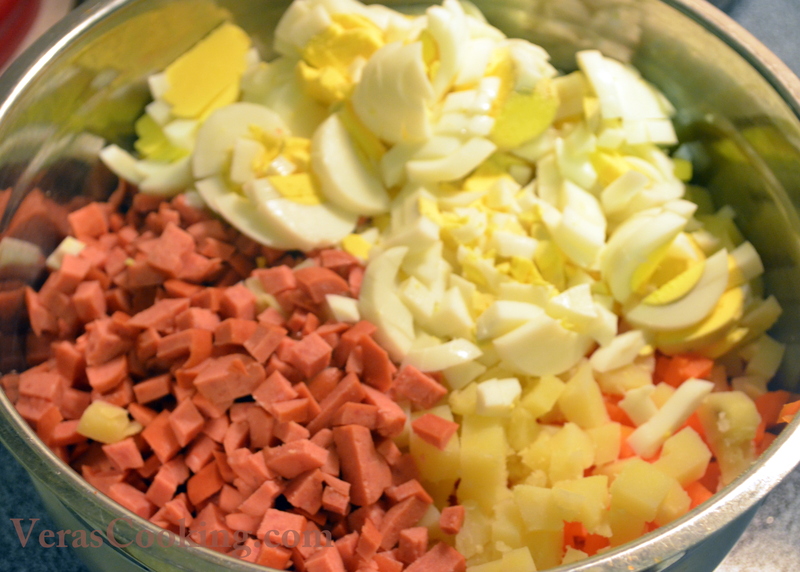 This salad is the most traditional dish for Slavic people, especially for New Year’s celebration. This famous Potato Salad can be served as appetizer or main-dish as it has the same quantity of high-quality protein that can be found in hot main dishes based on meat and eggs. Cook unpeeled potatoes 20-30 minutes until tender, drain and cool. With sharp knife peel and cut into 1/4 inch cubes. I usually cook potatoes and carrots together. The carrots need less time so I get them out earlier. Peel and cut carrots into 1/4 cubes as well. Cut sausage links and eggs in cubes. 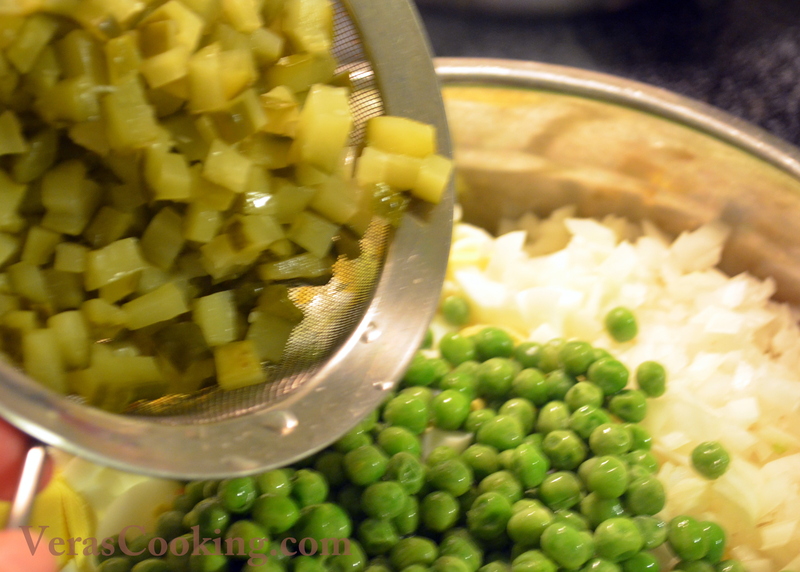 Rinse and drain frozen green peas. Cut pickles in cubes, drain well. Add onions and mayonnaise, toss together, and you’re done. There you have it. Enjoy! Cook unpeeled potatoes 20-30 minutes until tender, drain and cool. With sharp knife peel and cut into 1/4 inch cubes. I usually cook potatoes and carrots together. The carrots need less time so I get them out earlier. 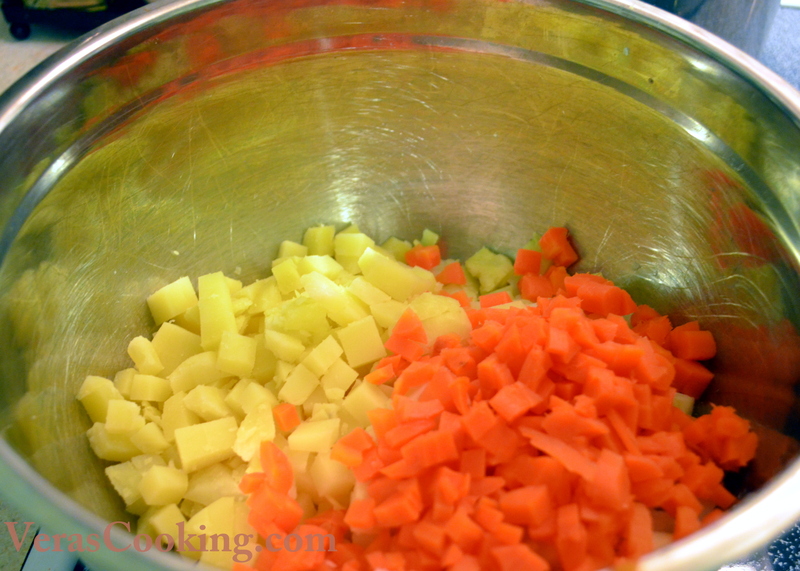 Peel and cut carrots into 1/4 cubes as well. Rinse and drain frozen green peas. Cut pickles in cubes, drain well. Add onions and mayonnaise, toss together, and you’re done. There you have it. Enjoy! What good about this salad is you can make it ahead of time, serve it the next day, and it will look and taste as fresh. Yes, definitely you can prepare all the ingredients and mix it all together when ready to eat. I suggest mixing it at least couple hours in advance for the flavors to develop. It’s good either way.